Estadio Azul was originally built for American football purposes, but soon after it had opened in 1947, Club America moved in and stayed at the ground until 1955. During its existence, Estadio Azul also hosted Necaxa for five years in the 1950s, and Atlante for several intermittent periods until 2002. From 1983 to 1996 the stadium was therefore called Estadio Azulgrana, after the club colours of Atlante. Most of these clubs switched between Estadio Azul and Estadio Azteca. In 1996, it was Cruz Azul who made the move to the Estadio Azul, having played the previous two decades at the Azteca. Over the years, several minor renovations have been made to Estadio Azul, however no major changes. In 2016, it was rumoured that Estadio Azul would be demolished in 2018 following the end of Cruz Azul’s lease of the stadium. The owner of the stadium would then replace the stadium with a new development as the stadium stands in one of Mexico City’s prime real estate locations. The news, however, has not been confirmed yet. 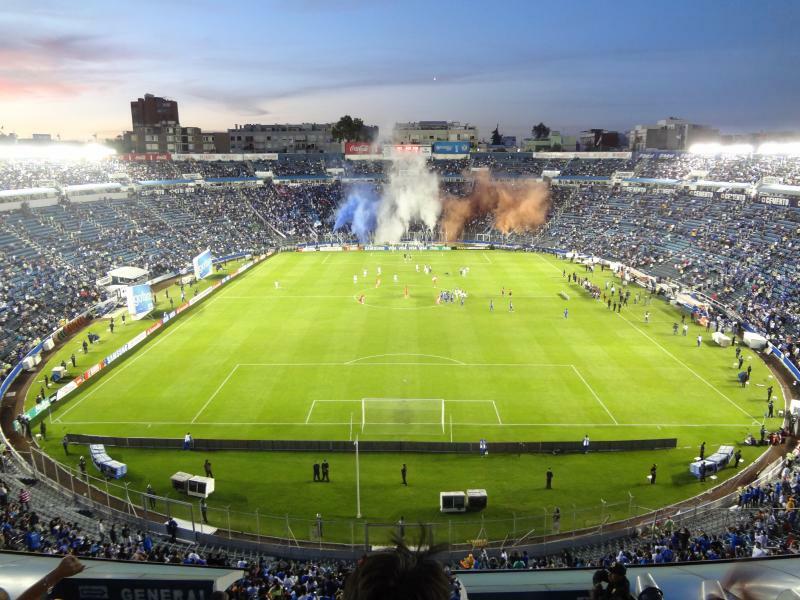 Estadio Azul is located toward the south-west of Mexico City, about 8 kilometres from the city’s historic centre and about 3 kilometres south from popular nightlife area Condesa. The stadium lies one block off Avenida Insurgentes, one of the city’s principal avenues. The closest metro station is San Antonio, which lies a 10-minute walk away from the stadium. Metro San Antonio is on the orange line 7, which runs in the west of the city and can be reached via a transfer at Tacubaya station further north. Both lines 1 (pink) and 9 (brown) connect with line 7 at Tacubaya. The stadium can also be reached with the bright red buses of the modern metrobus system. Line 1 runs all the way down Avenida Insurgentes and can be boarded in popular areas such as the Zona Rosa and Condesa. Take the bus in southern direction and get off at stop Ciudad de los Deportes. It is only a few minutes walking from there. Address: Indiana 260, Delegación Benito Juárez, México D.F. 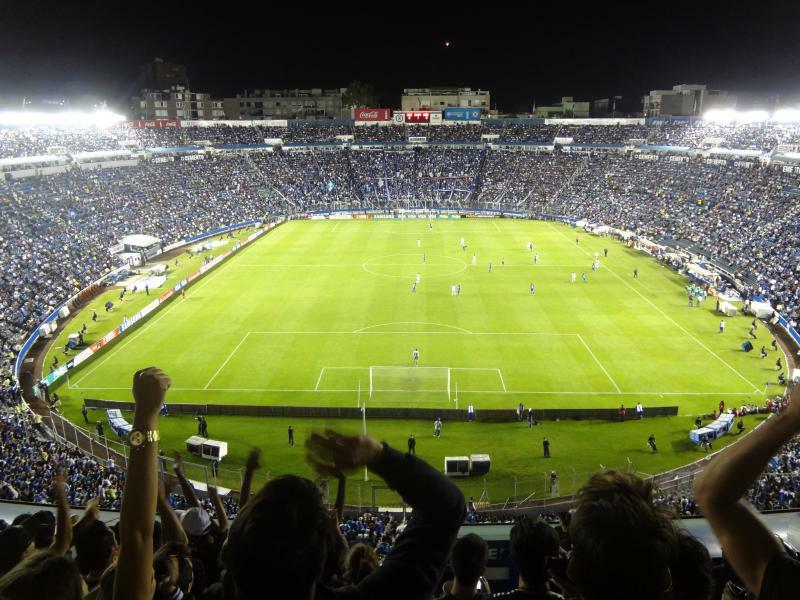 Estadio Azul is located just off the large Insurgentes Avenue in a generally well-off area. Insurgentes is lined with many modern bars and restaurants, the generic chain restaurants, as well as cheaper fast food joints, which provides for plenty of options before or after the match. There are two hotels located within a few blocks of the stadium. Hotel Diplomatico is reasonably priced and gets good reviews. Hotel El Greco is somewhat cheaper, but also gets slightly worse reviews. There are a few more hotels further north along Insurgentes near the World Trade Center, most a little or much more expensive. There are many more hotels further north along Insurgentes, in particular around Reforma Avenue and the Zona Rosa nightlife area. From here, getting to the stadium with the metrobus is also very quick and easy. Tickets for Cruz Azul matches can be bought online via Ticketmaster, or in person at any of the Ticketmaster sales outlets. Tickets can also be bought at the ticket counters (taquillas) at the stadium before the start of the match. 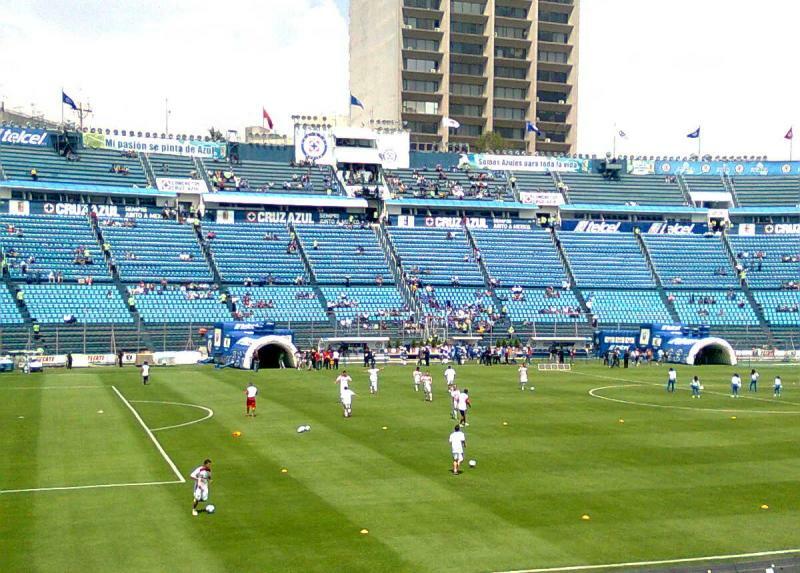 Cruz Azul only very occasionally sell out a high-profile match. Ticket prices depend on the opponent. For a regular league match these typically range from MX$70.00 for a seat high up in the stadium to MX$130.00 for the seats closest to the pitch. For high-profile matches these prices are increased to between MX$150.00 and MX$290.00. Cruz-azul.com.mx – Official website of Cruz Azul AC. Mexicocity.gob.mx – Official website of the Mexico City tourism agency. Metrobus.df.gob.mx – Website of the Metrobus transportation system. Metro.df.gob.mx – Website of the Mexico City metro. 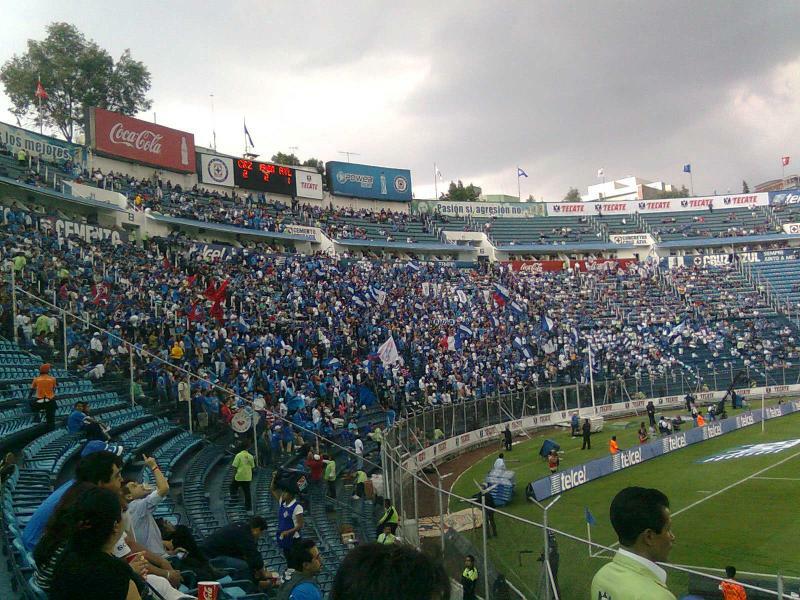 On the 18th of February 2012 we visited the local Mexico City derby between Cruz Azul and Pumas. It’s not the biggest derby in the country, but still one of the most emotional matches for both teams. As we knew the city pretty well, we arrived by local bus, but for someone less familiar with the city it will likely be more convenient to either use the metro or the metrobus. It was already fairly crowded around the stadium when we arrived, however there were no queues at all for the ticket windows (taquillas – located on the side of the bullring). The cheapest tickets had already been sold out so we settled for a pair of MXN 270.00 (about USD 22.00). 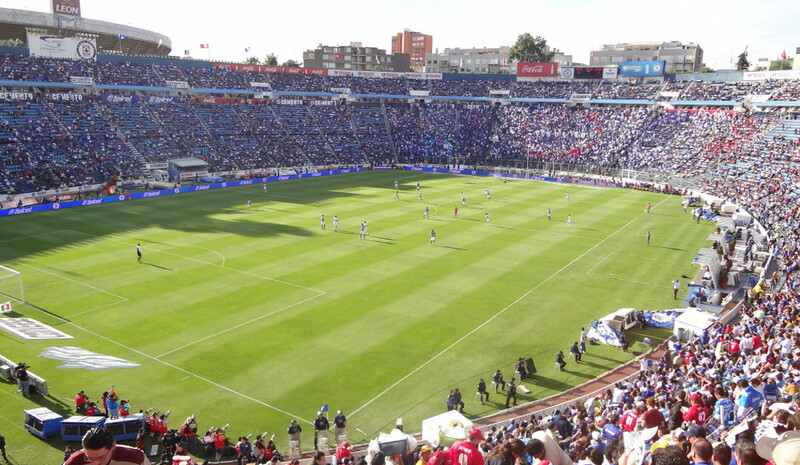 Our seats were excellent placed though, high in one of the corners with good views (Cruz Azul has fixed seat numbers). Mind that it isn’t allowed to bring a belt into the stadium (or in certain sections). 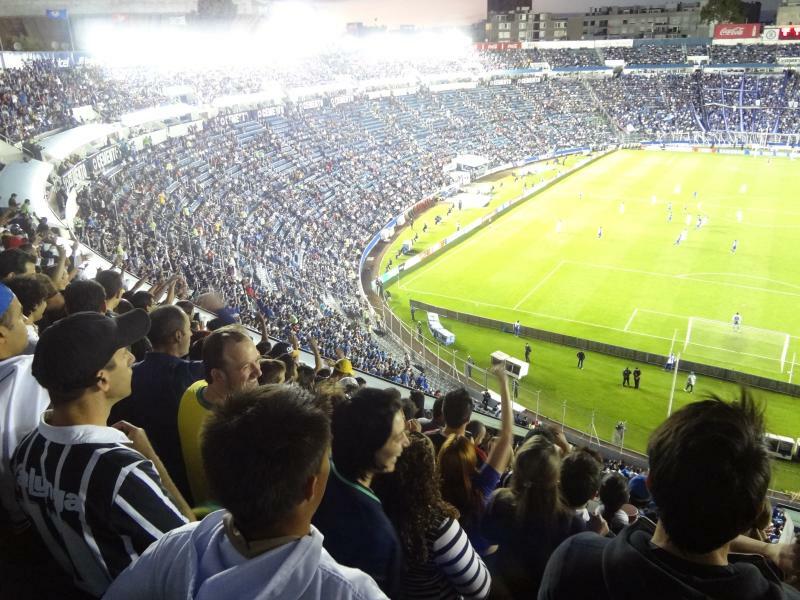 The stadium was definitely better filled than at a regular Cruz Azul match (at times the stadium can stay rather empty). I’d say it was probably about 80% to 90% full. Apart from the area for the visiting fans, there were also a lot of Pumas fans mixed up with the Cruz Azul fans, often groups of friends made up of fans of both teams, or even mixed couples. The atmosphere therefore stayed very friendly throughout the game. The match wasn’t of high quality, but the atmosphere was good, with both sets of fans chanting along. As in all Mexican stadiums one can buy drinks and various types of food from the vendors walking up and down the stands. A large beer (two bottles poured into a paper cup) costs MXN 60.00. After the match it took only a few minutes to get out of stadium. There are quite a few good fast food restaurants (tacos etc.) around the stadium to have a bite after the match and wait until the crowds have dissolved. Alternatively there are also plenty of more upscale food options at Insurgentes Avenue.